I like the Comments but I hope Keith also works in some more interviews. 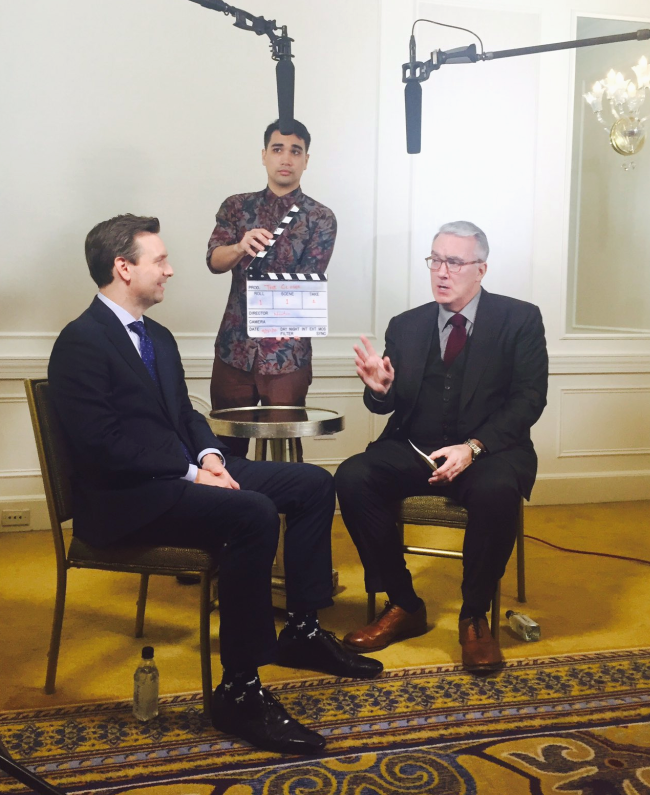 He knows how not to interrupt when the interviewee is warming up to a subject! Re: 'The Closer' premiers to rave reviews! 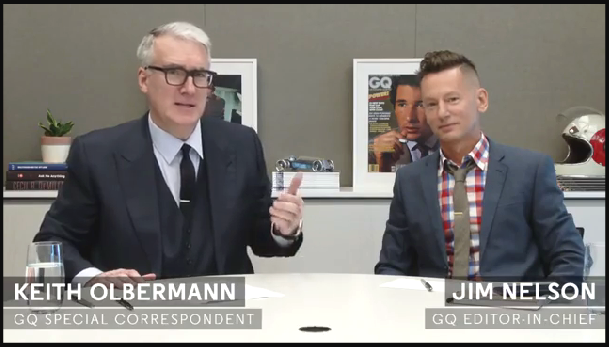 IT SHOULDN'T BE surprising to click on videos from the website of GQ and see a man in a nice three-piece suit. It seems a little lacking in context, though, when one of those guys repeatedly lays out passionately logical arguments for why Donald Trump is the “national shame” of the United States, rather than why wearing white after Labour Day no longer warrants the death penalty. 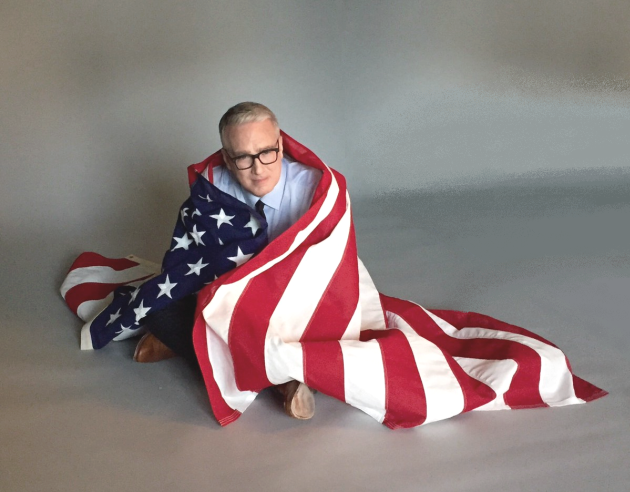 The Internet version of the magazine for America’s well-dressed men recently started giving shelter to Keith Olbermann, one of the Republican presidential candidate’s most ardent detractors. Many people are saying they don’t care for Trump; as far as I know, only the veteran broadcaster has gone as far as happily ditching his apartment in a Trump-branded building at a loss. “I'M FREEEEEEEEE!” Olbermann tweeted in July. 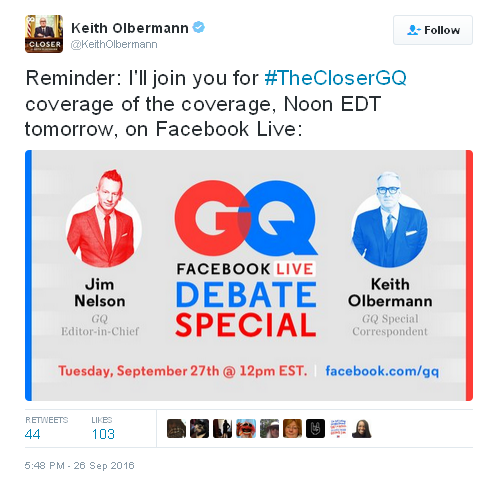 Twitter had been the political and sports commentator’s most potent weapon against the candidate until GQ premiered The Closer with Keith Olbermann on Sept. 13. He may not technically be banned from TV, but it kind of feels that way. The Closer was initially thought to be served in biweekly bites, but it’s taken Olbermann just 11 days to produce seven essays and an interview with Josh Earnest, the White House press secretary. Most are about six minutes or so long, but the first, precisely titled 176 Reasons Donald Trump Shouldn’t Be President, is about three times that. The production values are a modest improvement on most hostage videos -- there aren’t even any ferns -- but they are getting better. Olbermann delivers his pieces seated behind a desk, recalling the opening of his most recent ESPN series, which ended last year, but the bright lights of Times Square aren’t blinking in the background. Whatever. It’s the words that will whip up the hits anyway. You know how Trump went on The Tonight Show to playfully get his hair ruffled by Jimmy Fallon? Olbermann is doing the opposite of that. That’s not to say that viewers of The Closer won’t get a rueful chuckle, or that Olbermann is oblivious to the merits of entertainment. But when he goes off on Trump in episode 6 for his poorly disguised encouragements of violence against rival Hillary Clinton, the host’s righteous indignation is palpable. However, the response is considered, not knee-jerk. Olbermann always does his research, whether he’s opining on baseball or his country’s addiction to political assassination. Having bounced around MSNBC, Current TV and ESPN, gathering controversy and suspensions along the way, Olbermann likely looks to some people as though he can’t hold a job. It seems more likely that his tendency to speak truth to power is not appreciated by his higher-ups. But if it takes a former Sportscenter anchor to teach critical thinking, so be it. Two of the U.S. networks are going to get viewers in the mood for the presidential debate Monday night by running The Voice and Dancing With the Stars, with a half-hour set aside later for post-audition analysis. I have a hunch one of the best takes will be online Tuesday. So, nothing about how it’s time to pack up the seersucker, then? Here's a page where you can find all the videos, in order of release. Keith tweets that the first 6 clips have exceeded 6-million views! 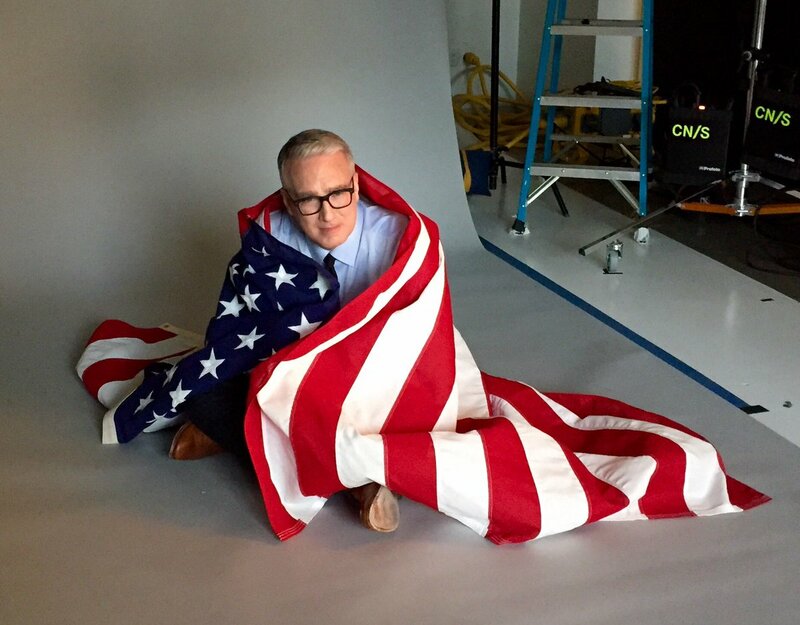 Wrapping himself in Old Glory? Heck yeah! Republicans don't frickin' OWN the flag!